When you need a bank statement translated, you should go to the best. Melbourne Translations is one of the leading bank statement translation services providers in Australia. In most situations, a bank statement is needed for either your quarterly or monthly documentation. It is also important for people who have a business since it will give you extra leverage when you are hoping for a business loan, balancing your account and even just to document your finances. In retrospect, a bank statement is a record of your bank activities. This means that whatever money comes in and out of your name is recorded for your security. Any malfunctions can be tracked to ensure that your transactions with the bank goes unhitched. When you are applying for a visa for a certain country, chances are, you need to present a bank statement. At most, you need these translated to the country that you are applying for. These are prerequisites for de facto partnership visa. Mostly as a proof of relationship. The National Accreditation Authority for Translators and Interpreters Ltd, NAATI for short, is the authority that sets the standard for translation services in Australia. Submitting translated documents without a NAATI Certification might get your translation rejected. Immigration departments often require only NAATI certified translations. Melbourne Translations is a quick, easy and reliable way to get your bank statement translation done. We are the leading provider of NAATI certified bank statement translations in Melbourne. We also provide other document translation and do it at record speed. If you are in need of a NAATI certified translation, get in touch and send us a copy of the document via the translation form. We will reply with a free quote in no more than 15 minutes. How amazing is that? Just go ahead and fill up the form for the translation quote and we will contact you as soon as possible. Our NAATI certified translations are one of the few who meets the high standards of NAATI. We accept any challenge at 100% and will provide the best service for you and your documents. Be it express or a standard bank statement translation service, we can do it without a sweat! You can even set your own deadline! How great is that? We have an amazing team of well-trained projects managers that are ready and prepared to handle your translation needs. Each one of them is dedicated to providing a high-quality and spot-on translation. Your documents will be handled with utmost care and also provide you with deserving customer-client privacy. Melbourne Translations also does not only pride itself with its high-quality bank statement translations. We are also champions in providing easy to reach prices that are suitable for all. Prices start at $69 per page and with the quality we provide, we are sure that you get a bang for your buck. When you choose Melbourne Translations, we are confident enough to say that you will receive your document on time. When you choose our standard bank statement translation service, it will take 2 to 3 business days for your translation to be completed. If you are in a hurry, we provide express services. We can prioritize your translation and have it done before your deadline. If you need this service, then please contact us via Live Chat or you can leave a message on the quote form. We will do what we can to accommodate your needs. Add to that, if you require a hard copy for your translation apart from the soft copy we provided, you only need to tell us and we will send you the hard copy via Australian post. Yes, Melbourne Translations offers NAATI certified bank statement translation services. All our translations are NAATI certified. With that said, we are confident that you get the best quality of the translation. Your document will be accepted in any Australian authority requiring NAATI translations. Yes! We have developed an online process of ordering translations. In just a few minutes and a few clicks, you can order one of our services online! You don’t have to come to our office. 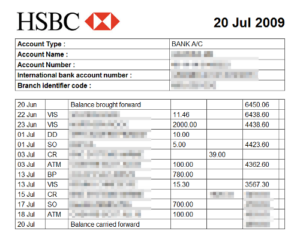 You can order a bank statement translation online. This helps you save more time and money. All you have to do is follow the steps provided below and you are good to go! Melbourne Translations can translate bank statements and all other documents from English to any of the following languages and vice versa. So you have a bank statement translation that you need done? And you are interested in our services? Then, look no further because you already found the best. We will be happy to help you with all of your translation needs, simply follow these easy steps! Ask for a free quote using the translation form located on this page. Once that is done, check your email. In less than 15 minutes, we will get in touch and provide you with the well-needed details for your order. Afterwards, pay for your order using PayPal, credit card, or bank transfer. Once we have confirmed your payment, your document will be handed to our translators for translation. When the bank statement translation is completed, a draft will be sent your way for you to recheck. If you are satisfied with our translation and revision, the final soft copy will be sent to you via email.